When 36,169 players take to the felt its typically for a freeroll tournament, or one of those Guinness Book of World Records $1 buy-in tournaments: Not so this past Sunday, when the $215 weekly tournament on PokerStars created a prize-pool of $7,233,800. PokerStars guaranteed a $4 million prize-pool and $1 million for the winner of the tournament, celebrating the 4th anniversary of the popular Sunday tournament. With the massive number of entries the prize-pool quickly eclipsed the guarantee, and the winner of the tournament took home $1.1 million. The lucky winner was “RichieRichZH”, but perhaps the most remarkable aspect of the final table was the absence of any deal-making; a very rare occurrence in any tournament these days, let alone one where hundreds of thousands of dollars rest on the turn of card. 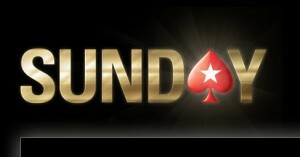 This entry was posted on Tuesday, February 23rd, 2010 at 2:07 pm and is filed under Poker News. You can follow any responses to this entry through the RSS 2.0 feed. You can leave a response, or trackback from your own site.